faith-healing death of their son. Maurer touched upon religious freedoms, saying he thought the community was very respectful to beliefs from congregations like the Followers of Christ Church, which believes in faith-healing at the exclusion of most medical care. But there are boundaries for religious freedom, he said. “It is up to us as a community and a criminal justice system, and government, to take very seriously that societal obligation … and recognize that investment and interest we have in each and every child,” he said. The sentence could be a “pause for reflection” or re-examination for the Followers of Christ church, said Maurer, who added that he believed the church was capable of “softening the rigidity” of their beliefs on excluding medical care. The Beagleys and Worthingtons are members of the Followers of Christ Church. Members of the Oregon City church have a lengthy history of child deaths from lack of medical care that influenced a 1999 law eliminating the religious freedom defense in cases involving the welfare of a child. 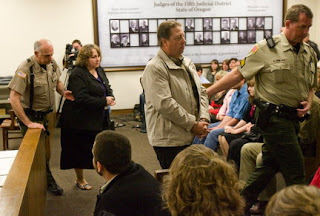 Maurer made it clear that the sentence was a direct attempt to deter other members of the Oregon City-based Followers of Christ Church from relying on faith healing to the exclusion of medical care. He said other formal and informal attempts to work with the church to get them to recognize serious conditions and seek medical treatment had failed, as evidenced by the deaths of Neil and his niece, Ava Worthington.